When you were a kid you probably once tried to imitate strumming an invisible guitar, mimicking how rock artists you saw on MTV strummed theirs. If you were to do it now, as an adult, you’d probably be embarrassed about it, thinking that you’re no rock star. But for many dancers, this move is a legitimate dance. And there’s even a competition for it. Welcome to the world of Air Guitar. This is described as having a “philosophical approach” when it comes to the dance. It describes the performer as “letting himself/herself go with the flow.” Since a song or music accompanies the performance, the performer usually follows the rhythm of the song. In this school, however, it tells the performer to follow what he feels right instead. This school takes a more technical approach to the dance. The goal of this school is to look as real as possible. This means actually knowing how to position your fingers for each pick or strum you do. Your attitude and performance must give an air of authenticity and to look like an actual rock star as much as possible. The point of this school is to look as exaggerated as possible. It is described as having a connection to glam rock, and “requires charisma and stage presence.” The dance has to attract a lot of attention to the performer has to be a show-off. The avant-garde of air guitar, this school combines air guitar with other elements that aren’t related to rock music. What this means is that you can have an unlimited number of elements to add to your air guitar performance. However, as with all art movements, purists tend to hate the avant-garde, saying it corrupts the art form. Performers of this school should watch out from alienating their audience. There are several contests and championships for performing air guitar. Two of the oldest championships are the UK Air Guitar Championship since 1994, and the Air Guitar World Championships since 1996. Apart from that, there are other national championships from several countries: Japan, Australia, the United States, Canada, Denmark, and Germany. Apart from these countries, there’s also a list of former nations such as Belguim, Russia, and France. 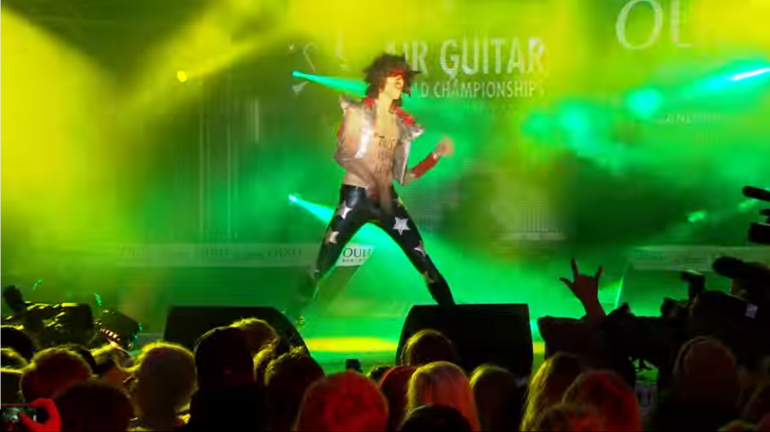 1st Image: The trailer from the Air Guitar World Championship, via Youtube. 2nd Image: The logo for the UK Air Guitar Championship, via their website.